The 2002 Mount Vernon 24kt. gold finish Christmas Ornament is now available. 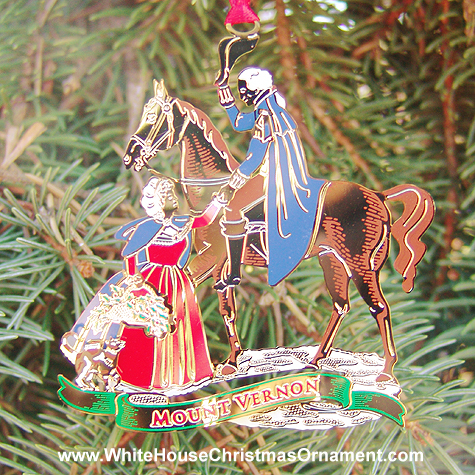 George Washington�s remarkable career as a soldier and statesman required that he criss-cross America during lengthy travels that, all told, kept him away from his beloved Mount Vernon for more than two decades. Washington was naturally glad to see the Mansion rising on the banks of the Potomac River at the end of every long voyage. As he rode up to the Mansion doorway, though, he found the greatest reward for his long war-years of absence � the loving embrace of his wife Martha and a joyous welcome from her excited grandchildren.